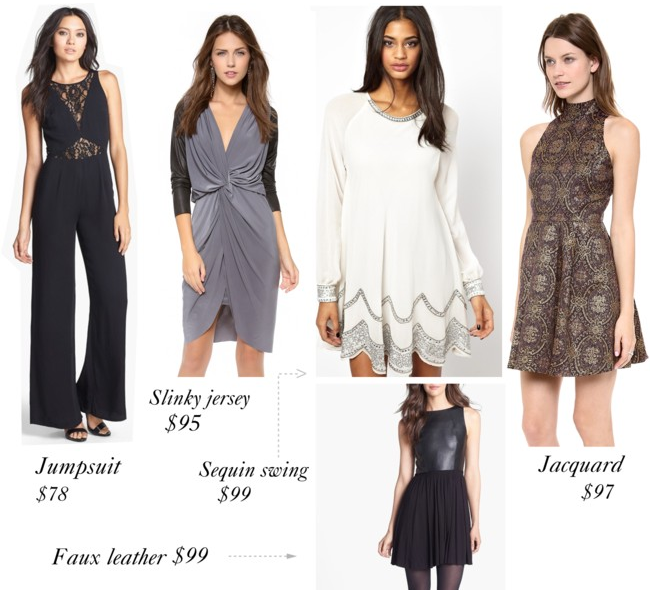 New Year’s Eve Dresses…Under $100! I snagged my New Year’s Eve dress a few weeks ago, and it’s currently being altered (I definitely felt a little skanky taking it to the sweet, little Asian lady and telling her it needed to be shorter). But I digress. Let’s start with my favorite. I absolutely love the BB Dakota Barker Dress. The metallic detailing combined with the jacquard print is downright stunning not to mention it has killer movement with that full skirt. If you’re looking for something different, how about a jumpsuit? This Lace Inset Jumpsuit at Nordstrom is just $78 and is the perfect option if you aren’t feeling a dress this year. Grab a metallic clutch, your favorite heels and you are golden. It figures that the Faux Leather Fit and Flare Dress sold out, so check out the Bailey 44 Dante Faux Leather Panel Sheath Dress (on sale for $89) and the Antimatter Dress (on sale for $104). Let me tell you, when Bailey 44 dresses go on sale, they do. not. last. Last but not least, the ASOS Sequin Swing Dress and Petra Twist Front Dress. If you wanna rock a swingy beaded dress this year without looking like a circus performer, this is it. It’s got the right amount of embellishment and the gorgeous swing shape is perfectly festive for ringing in the New Year. The Slinky Jersey Twist Dress is a great choice if you want sleeves and comfort without looking drab. Add a pair of tights and short booties with this dress for an edgy and modern look. Many thanks to my blogger bff Ashley for having me over on her famously witty and pretty space. Swing by my blog and let me know which dress is your favorite + what you’re wearing on NYE!